Playing Catch – Beginner and Advanced techniques of receiving the ball. Total practice time 5-15 minutes. Throwing – (Individual Skills) Grip, “Shak”, Ready, Break, Power Position, Throw, Wrist Flips, Controlled Catch, Catch Step Throw, Pitching, (Group Work) Relay Drill. Total practice time 10- 25 minutes. Fielding- (Individual Skills) Controlled fielding of groundballs and flyballs. Total practice time 10-25 minutes. Ready: Starting position-gunfighter- (“SHAK’d up” towards target) with hands together at chest. Break: Also known as arm action. Hands come apart with thumbs under (like dumping a water cup) while taking arm thumb to the thigh, knuckles (fingers) to the sky, elbow up high. Power Position: Also known as arm slot. Feet spread shoulder width, knees flexed, glove or elbow at target, proper closed body alignment (SHAK), throwing elbow at shoulder height, back of throwing hand facing target: see the “W” (proper grip will make a “W” on ball). Throw: Also known as arm path. Small step, hips rotate, tuck, (love glove to chest) while allowing throwing arm to go with body. Stick chest out towards glove, head should never move off target. Bend back and bow to finish. Follow through with throwing arm and show back of throwing shoulder to target. Wrist Flips: Players stand 7-10 feet apart. Four-seam grip with elbow at shoulder height extended in front of body. Glove under elbow for support. Ball is flipped to partner with emphasis on rotation and follow through. Done daily, each player should aim for 5 perfect flips. Controlled Catch: Two lines, one throwing (directional side to target, ball in glove), one line receiving (gunfighter position). On command, (thumb to thigh knuckles to sky, glove spin throw) players from throwing side throw to receiving side. Catch, Step, Throw: Throwing line and receiving side in gunfighter position. Throwing side steps to target lining up directional side and does thumb to thigh, knuckles to sky (arm action) at same time. On command of Throw, player throws ball. Receiving line positions body to receive ball, once received, player immediately steps in line to target and performs proper arm action. Once player has fundamentals correct, put it all together. Relay Drill: Line-up a minimum of three players about 5-10 feet apart. Ball is thrown down the line to each player. Pitching Knee Lift (first intro to a pitching drill): Lift the throwing leg to a minimum height of thigh parallel to the ground. Get balanced with weight over rubber and posting leg. Ground Balls on Knees: Roll ball back and forth to control with two hands with glove. Ground Balls Standing: Standing with partner close together roll ball back and forth for control. Forehand Play: We must get the front shoulder on the target on this play to keep the ball from sailing away from the target. Backhand Play: You must make sure that you are bending at the knees, instead of straight down at the waist. You want to keep your eyes as close to the glove as you can. Set-Up: Stance: Feet parallel, toes pointed straight, weight on inner balls of feet, knees inside feet, grip: knocking knuckles lined up, back elbow half way up, front shoulder on pitcher, head upright eyes level, hands held on top of strike zone. Stride Position: Stride: Step to pitcher, front toe still pointing to home plate, weight is at a 50/50. Slow Motion Swings: Any new mechanical idea or adjustment should be executed correctly in a slow motion dry swing so that the hitter can feel the proper movement. Standard Tee Work: Emphasis on stride alignment and not over stepping the ball and tee. Early Stride-Separation: Front or side flips, short pitch or batting practice where the hitter goes through their weight transfer back and stride separation then pauses in a strong launch position before the ball is flipped. The purpose of this drill is to show the hitter this is their strongest hitting position and this is where they should be when they take a pitch. Whiffle Ball Front Toss: Multiple lines at one time for more repetitions. Coaches toss the balls so players can practice consistent swing. Step In Drill: The hitter will be in their normal set-up but just with an open stance. They will have the bat on the shoulder and when the stride foot advances forward the hands take the bat to the proper launch position. Game Play Situations: Simulate situations with coach hitting fungoes and players running bases and playing defense. Other coaches should roam field-giving instruction from play to play. With advanced players, they may hit with coaches pitching. Fly Ball Communication: Two players line up at least 40 feet apart. A ball is hit or thrown in between the players forcing them to communicate and call the ball on its downward flight. A player should call the ball until it is in their glove. 1. Drop Bat, step w/back foot out of box. 2. Three step peek. 3. Hit Front part of bag. 5. Breakdown/ look to right for overthrow. DRILL #1: Coach acts as 1st baseman w/ball in hand. As runner crosses base and looks to right coach either holds onto ball and runner returns to base, or coach tosses ball behind him and runner sees overthrow and breaks for second base. 1. Drop bat, back foot out of box. 2. Three step peek, read play. 3. Banana route, (3 steps out -3 steps in). DRILL #2: Coach sets up as shortstop. As runner sneaks peek coach simulates fielding a ground ball, runner runs through bag. Coach can also simulate going out for cut-off by turning around with his back to infield. Runner takes banana route and rounds bag. 4. Slide, stop on bag, round 3rd base pick up ball. DRILL#3: Position a coach in 3rd base coaching box. Runner runs, picks up coach half way to second. Coach signals player to hold up at second or continue to third. As player reaches second, pick up coach again. After reading play coach may signal player to advance or hold up. Runner picks up coach into third. 2. Primary & Secondary leads. 3. Read infield grounders off bat (left or right of body). 4. Pick up coach, round bag, inside corner. DRILL#4: Position a coach shortstop side of pitching mound. Runner begins secondary lead. Coach rolls ball. 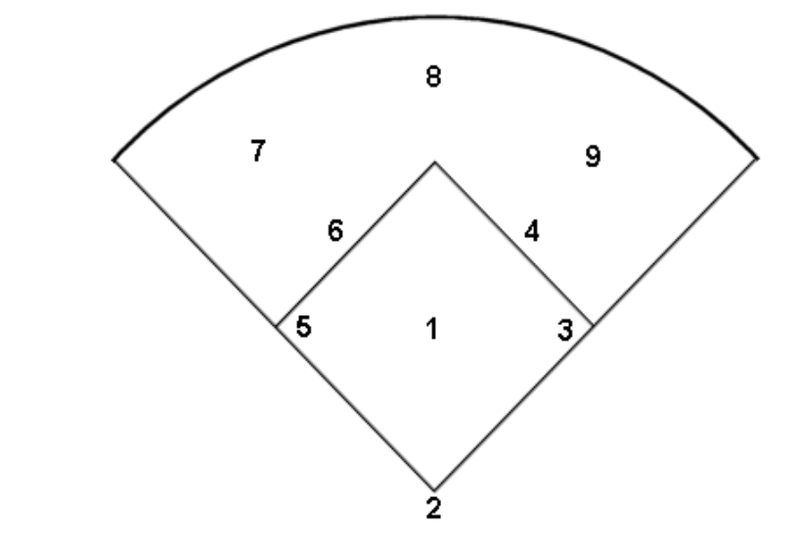 If rolled left side of runner, runner advances toward third, pick up coach at third base. If ball rolled to right of runner, runner stays at second. Position a coach in third base coaching box. Runner advances towards third and coach signals to hold up on bag, round bag and pick up ball, or round bag and advance to home. 1. Lead in foul territory, return in fair.